Payments as low as $141/mo. Or, apply & pay as little as $141/mo. Holy Granadillo! We can't believe this our first Granadillo back/sides instrument (thanks for the tip, Richard Hoover!) but we are certain it won't be our last. This tropical hardwood boasts the same glassy clarity and ringing sustain you might expect from something like Cocobolo at a fraction of the price. That gorgeous top offers a warm, organic element that rounds off the response and the body style, well, you just can't beat a OOO 12 for wide-open, airy presence. This is the kind of instrument that draws in player and audience alike--don't miss out on this magic, folks! 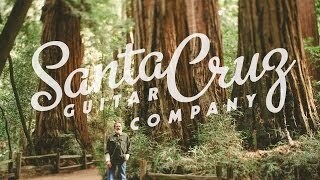 Santa Cruz builds some of the best acoustics on the planet! I'm a fan of guitars that are using sustainable woods, and the Granadillo on this one sounds incredible! We are continuing to see builders use different types of wood as our planet runs out of the traditionally used hardwoods. Hats off to Richard Hoover for showing that in the right hands, you can build a guitar that's good for the player, and good for the environment.